At NMC, we develop 95% of our projects on our own Content Management System. Our system gives designers total flexibility and is very intuitive for end users, so it ends up being a good fit for just about all of our clients. However, occasionally clients come to us with a strong backend preference for certain reasons. This has happened a few times with the HubSpot CMS, due to the system's helpful business analytics and supporting community. 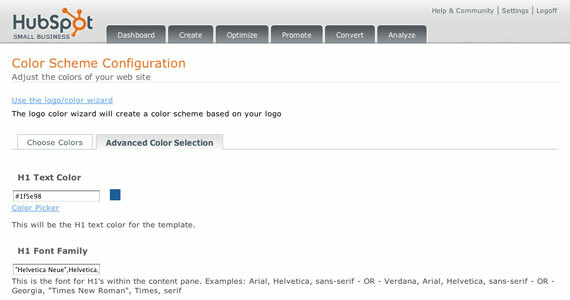 The HubSpot CMS wasn't originally developed for custom designs and is more geared toward the company's templates. However, with some elbow grease, you can get a custom look on there that follows HubSpot's requirements. We have now designed a couple of custom HubSpot sites (including SLX for Sun Microsystems) and put together this brief tutorial on some shortcuts to freely developing on the system. Developing on an unfamiliar platform has it challenges, most of which is relinquishing control. For me, not having control of front-end conventions is frustrating. As a web standards enthusiast I’ve established patterns during the build-out of sites designed to minimize browser errors and cut down on development time. Hubspot’s system generates a CSS styles that are placed within the body tags, taking precedence of entire styles sheets I load to the DOM. Since the design specs I had to work with matched one of the systems page templates I thought it would be best to work within the confines of the system. This turned out to save me a lot of headaches later. When you need to add static content or custom images, you need to add a new page Module. Given all Module options, I recommend using plain markup. You can create things with a fresh slate and not be tied down by the templating system’s css conventions and markup. When you’re configuring your new module make sure you select the options to not use the module title and to use plain formatting. With those two items selected, you now have that clean slate to work with. If any of you are charged with developing a site on HubSpot, hopefully these tips are helpful in tackling the project. While HubSpot's system isn't ideal for totally custom designs, with some extra work, you can still put together an attractive site. I know this is an old post but you gave me some insight. I really like your write up. I've done several of these Hubspot redesigns and I actually do find them to be far too time consuming because of the inability to start a site without having full control over layout CSS. It kind of makes me feel "dirty" to have to write "important!" all over the place -- I do wish there were a better way.